I’m Luke, I was born without my left hand. From a very young age, my dad taught me to adapt to life with one hand. These lessons (although they didn’t feel like lessons at the time) came in the form of puzzles and other mind-bending tasks. It was these, I think, that paved the way for my later interest (and now career) in engineering and problem-solving. Between the ages of 6 months old and 5 years, I used a myoelectric hand which was very heavy and clumsy. It would crush soft objects like sandwiches and drop things randomly when the sensors misread my muscles. Needless to say, this could look quite creepy, and as a young child, made me feel like the technology was hopeless. Thanks to the Hero Arm, the opposite is now true. I was never exactly bullied at school, but children are naturally curious and asked a lot of questions. 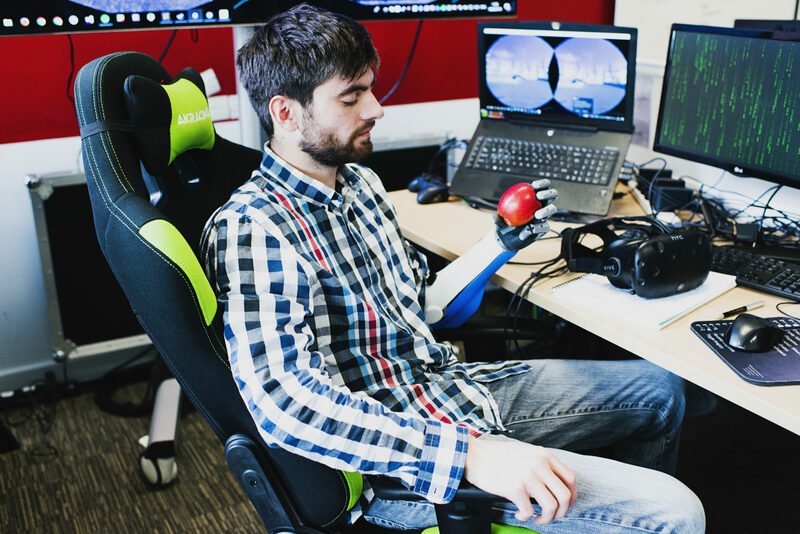 As a result, I became quite determined to show that I didn’t need a prosthetic and pushed myself to find solutions that would enable me to be as good as, or better than, abled people at two-handed tasks without wearing one. First I got into swimming, which helped strengthen the muscles that I would otherwise not have developed. And this eventually led me to play underwater hockey (octopush) and take up rock climbing. No matter how much I compensated for my disability, however, I would still spend far too much time worrying about fitting in. When you live with a visibly apparent disability, you do become sensitive to the fact that people stare. The Hero Arm changed that and transformed the way people looked at me. Instead of avoiding eye contact with me on the bus or on the street, people now come and ask me how it works and if they can have a go. They’re genuinely excited about the technology, and you can’t blame them — it is very cool. 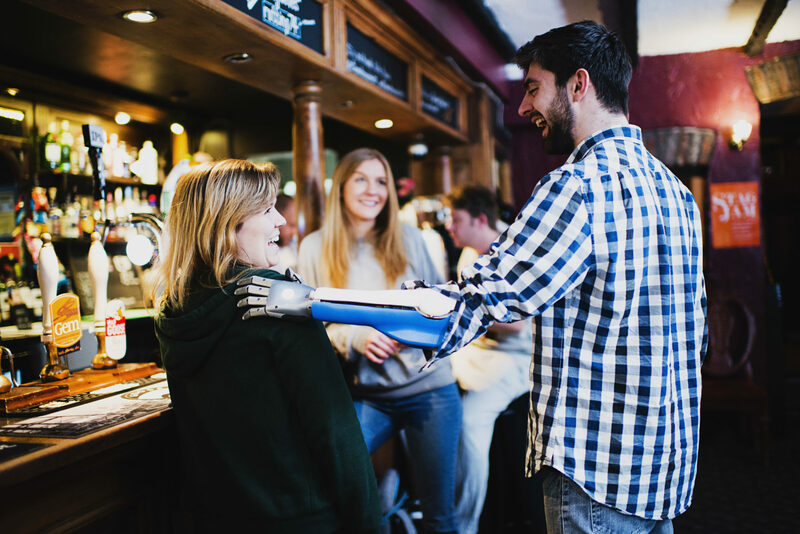 I first encountered the Open Bionics team when I’d just finished my Engineering degree. As you can imagine, I was naturally fascinated by their work. They explained how the Hero Arm worked and let me test one of the prototypes. I was blown away by the responsiveness, and how light the whole thing was. Not to mention the way people reacted to seeing me wear it. I also started to realise that I could do some everyday things that I had accepted as things I couldn’t do. These are the things most people take for granted, like holding a saucepan in one hand while stirring with the other. Even carrying shopping to and from the car. I also realised I could finally hold two VR controllers, which was perfect, as job was at a company that worked with VR and simulations. I’ve now been living with and testing the Hero Arm since 2017, and I can honestly say that it’s tough to imagine life without it. 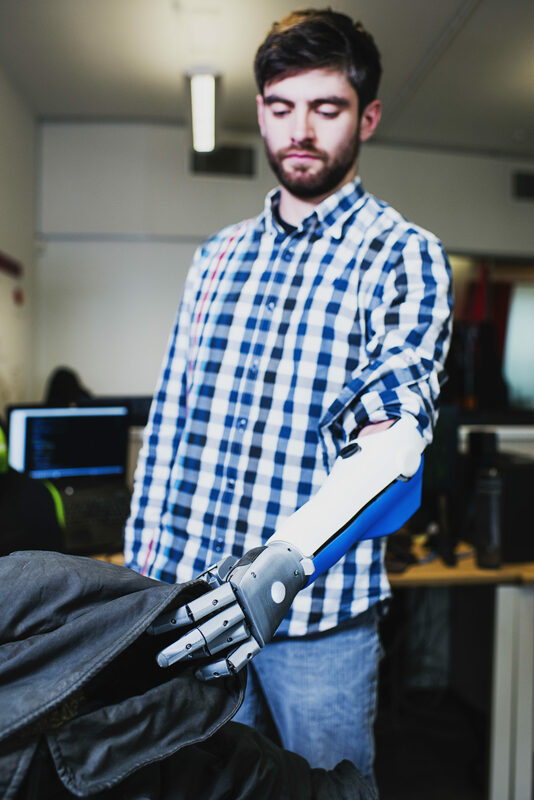 Luke wears a Hero Arm, the world's most affordable bionic arm. The Hero Arm is now available through private prosthetic clinics for people with below-elbow upper limb differences, aged 9 and above.